This species is accepted, and its native range is S. Mexico to Tropical America. Perennial. Stolons absent, or present. Culms decumbent; robust; 200-400 cm long; 10-15 mm diam. ; rooting from lower nodes. Culm-nodes pubescent. Leaf-sheaths glabrous on surface. Ligule a ciliolate membrane; 1-2.5 mm long. Leaf-blades elliptic; 35-75 cm long; 30-50 mm wide. Leaf-blade surface glabrous. Leaf-blade margins scabrous. Leaf-blade apex acute. Inflorescence a panicle. Panicle open; pyramidal; 55-70 cm long; 25-40 cm wide; contracted about secondary branches. Primary panicle branches ascending, or spreading; whorled at most nodes. Spikelets appressed; solitary. Fertile spikelets pedicelled. Spikelets comprising 1 basal sterile florets; 1 fertile florets; without rhachilla extension. Spikelets ovate; dorsally compressed; acute; 2.5-2.9 mm long; falling entire. Glumes dissimilar; reaching apex of florets; thinner than fertile lemma. Lower glume ovate; 1.6-2 mm long; 0.66 length of spikelet; membranous; without keels; 3 -veined. Lower glume apex acute. Upper glume ovate; 2-2.5 mm long; 1 length of spikelet; membranous; without keels; 5 -veined. Upper glume apex acute. Basal sterile florets barren; without significant palea. Lemma of lower sterile floret similar to upper glume; ovate; 2-2.5 mm long; 1 length of spikelet; membranous; 5 -veined; acute. Fertile lemma elliptic; dorsally compressed; 1.5-1.8 mm long; indurate; shiny; without keel. Lemma margins involute. Palea involute; indurate. Anthers 3; 0.7-1.1 mm long; purple. Caryopsis ellipsoid, or oblong; 0.9-1.1 mm long; grey. South America: Mesoamericana, Caribbean, northern South America, western South America, and Brazil. Paniceae. Fl Costa Rica 1994. Nativa en Colombia; Alt. 0 - 500 m.; Llanura del Caribe, Valle del Cauca, Valle del Magdalena. Davidse, G. & al. (eds.) (1994). 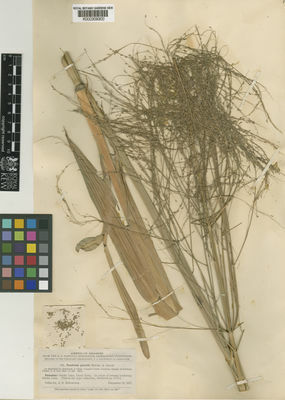 Flora Mesoamericana 6: 1-543. Universidad Nacional Autónoma de México, México, D.F. Brako, L. & Zarucchi, J.L. (1993). Catalogue of the Flowering Plants and Gymnosperms of Peru Monographs in Systematic Botany from the Missouri Botanical Garden 45: i-xl, 1-1286.